This week, Waltzingmouse is celebrating their 100th sketch, and I am so glad to be able to participate. I am gradually building up my collection of Waltzingmouse stamps, so each challenge gets a little bit easier for me as I have more stamps to choose from. This week, I used stamps from Nordic Spring, a beautiful stamp set that I received as a gift from a Papertrey Forum friend from the UK, who I helped out as a shipping buddy. To say that I was surprised and delighted when I opened her 'just a little something for your time' gift would be an understatement. 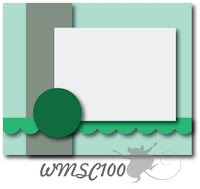 There are many great prizes and so many inspirational ideas on the WM sketch challenge blog. I hope you can check it out and play along. The more entries they get, the more prizes there will be. I hope to sneak one more card in, too. I like how you made your own lace trim using the Nordic Spring set Joyce, and that is a great butterfly too. The Winter Wisteria and Simply Chartreuse color combination is a good one to go with the butterfly as it makes it really stand out and shine. Oh that must have been so exciting to receive that set as a, thank you gift. Sounds like two nice people! Your card is beautiful with all the pretty stamping. Its all looks so much like stitching. Love the color combo and the heart boarder. It sure is easier with more sets. How fun to receive such a fabulous gift! It is a beautiful stamp set and your card is so sweet, the colors so soft and perfect for a get well card. You did an awesome job cutting out that beautiful butterfly. Just fabulous!!! and your cutting is fabulous! Love that butterfly in purple! Hi Joyce! Another beauty! I love the purple and green together. The butterfly looks like its floating along in a garden. I like how your little button matches that winged beauty! This is so pretty. I love those colors together and the lacey feel of the card. Awww! What a sweet friend! I love how incredibly generous bloggy crafty people seem to be. It's a pretty amazing little community. The stamps are lovely especially that butterfly and I really like the lilac and green. What a wonderful gift! Nordic Spring is such a fabulous set. Those colors are fantastic together and I love your faux lace and gorgeous butterfly! Super sweet colours on this card, and what a great friend you have!! Thanks for joining us for the 100th sketch!! Loving those colors together, Joyce! Haven't tried the butterfly in purple (yet!) and it looks so pretty! This card sure will brighten someone's spirits. Happy 100th sketch! So glad that you found the WMSC this year :)!! What a sweet gift from your friend. How surprised you must have been. Your card is so pretty with those amazing colors. I love purple and always enjoy seeing cards using it. I love that lace stamp you've used too. How perfect it worked to follow the sketch. Thanks for joining us this week during the Waltzingmouse festivities!